Steve Jobs at the introduction of the first Mac in 1984. Inside the theater-style auditorium, speakers were blaring the Pointer Sisters song, “I so excited, and I just can’t hide it,” which seemed perfect. A few thousand people were milling about, nervously talking, waiting for no one knew exactly what. Apple employees in blue jeans and t-shirts were mixing it up with Apple shareholder in suits and ties and with dozens of journalists from around the world. On the stage was a small table upon which an object about the size of a watermelon turned on its end was draped with a black cloth. It was, of course, a Macintosh, but not just any ordinary Macintosh. As luck would have it, the Mac team had acquired just enough pre-released 64K memory chips to put together two 512K Macs, one of which was the machine sitting on the table. Otherwise, a 128K Mac, the kind Apple customers could actually buy, could never manage to do all the magical tricks Steve Jobs planned to demonstrate. I knew the presentation had been put together during a marathon day and night session by a small group of very tired developers and that it had been difficult to get Steve to come in for a rehearsal. Things would definitely go wrong, I feared. Still, I had to marvel at the sheer chutzpah that went into this day. 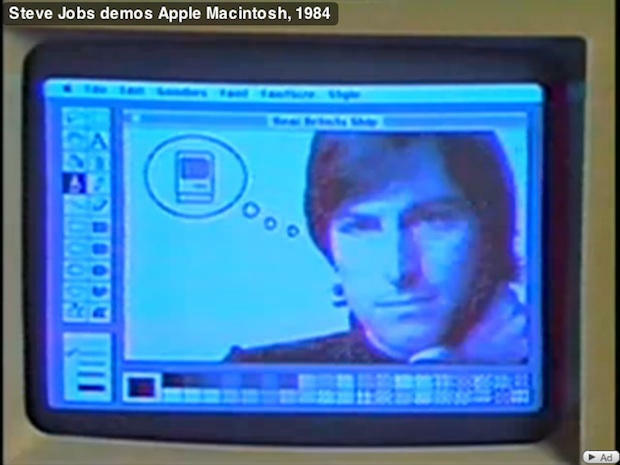 Aside from the 1984 commercial, Apple’s PR and marketing buildup had been tremendous. The news preceding the event was on parallel to the Super Bowl itself and yet, if you thought about it, Apple was just a small company announcing a new product–something that happens every day. Somehow, Steve Jobs had risen to biblical status. He had made a million gallons of lemonade out of just a few lemons. 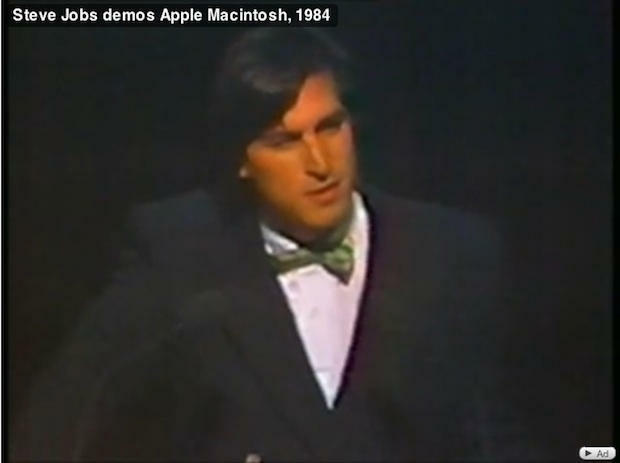 No one really knew what to make of this style of product introduction until Sculley coined the term “event marketing” and Apple Computer, with Chairman Jobs at the helm, quickly became the all-time master. Steve was in his bow tie phase. With large strides, he strolled to the front of the stage in a beautiful double-breasted suit and bow tie, which made him look more than a little bit like a young Howard Hughes. He strutted about like I imagined Howard Hughes would do. He bounced. He nearly skipped. He acted a tiny bit crazy. This was his moment of supremacy. Steve Jobs would rub dirt into the faces of his enemies and they would like it. All he had to say was, “Hello, I’m Steve Jobs,” and the crowd went bananas. After taking us through a brief history that leads to IBM entering the personal computer market in November 1981 and to Apple and IBM dominating the market by 1983, he paused for a moment. I could feel the electricity. The 1984 Commercial, with its volume turned up thunderously loud, blazed on a huge screen behind him. The commercial ended, followed by the theme song from the movie Chariots of Fire. Following this second introduction, Steve put the Mac through its paces. It sang to us. It performed mathematical calculations with the blinding speed of a Cray mainframe. It drew beautiful pictures. It communicated with other computers. It bounced rays off satellites and sent a subversive message to the Soviet Union. The Mac seemed capable of doing anything Steve willed it to do and at the same time, is was as easy as pie to use and as friendly as your local kindergarten teacher. The whole world seemed to gobble this up and for awhile, I thought Steve and his crew had pulled it off. Steve was right about going ahead with the launch and Andrew Fluegelman was wrong about delaying it. The little problems Andrew perceived, lack of memory, lack of software, etc., weren’t really all that important. People lined at the computer stores and better yet, subscriptions to Macworld magazine poured in. In the first 100 days, Apple sold 70,000 Macs.